RIT Student Government President-elect Farid Barquet addresses a crowd at a recent event in appreciation of retiring RIT President Bill Destler. 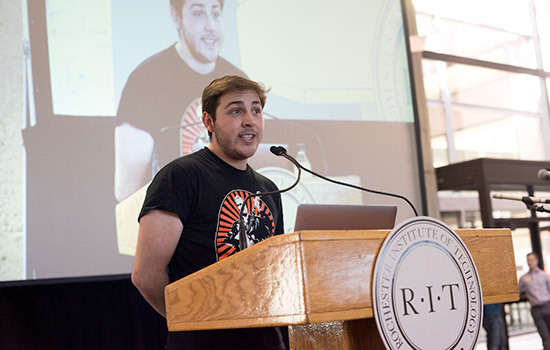 Farid Barquet, who is finishing his third year as a biomedical sciences and biotechnology double major, has been elected Rochester Institute of Technology’s Student Government president for the 2017-2018 academic year. His term begins June 1. Student Government vice president will be Bobby Moakley, a second-year environmental science and global studies double major from Boston. Barquet, from Mexico City, said he didn’t know anything about RIT until he applied. He applied to other schools, but his visit to RIT in May 2014 convinced him he wanted to be in Rochester. Barquet is currently director of programming for Student Government. He’s also involved with orientation, admissions, served as a peer adviser for first-year students in the Academic Support Center and is a member of the Sigma Chi fraternity. He enjoys theater and was a lead in an RIT Players production of Urinetown in his first year. “I really like music, singing and dancing, and playing the piano,” he said. He finds it easy to express himself. His native language is Spanish, and he learned English when he was 4 years old and French when he was in middle school. He took Italian classes at RIT and has an immersion in American Sign Language. Even though he’ll be representing more than 18,000 RIT students as Student Government president, he wants them to know everyone will have a voice. Barquet’s new responsibility won’t mean he’ll be taking time from his studies. He’s planning to take 18 credit hours next semester but has selected a schedule to allow plenty of free time during the day to attend Student Government meetings and meet with people. He said his focus will be improving the community. He will work closely with Moakley, who is coordinator of Into the ROC, a program initiated by RIT’s Center for Leadership & Civic Engagement last fall to enable students to experience civil and community engagement and opportunities for cultural engagement. They have visited museums and parks locally and as far as the Finger Lakes and Corning Museum of Glass and have volunteered at festivals and for food cupboards.